The first thing to build is the power supply, obviously a prerequisite for operating any of the other modules. 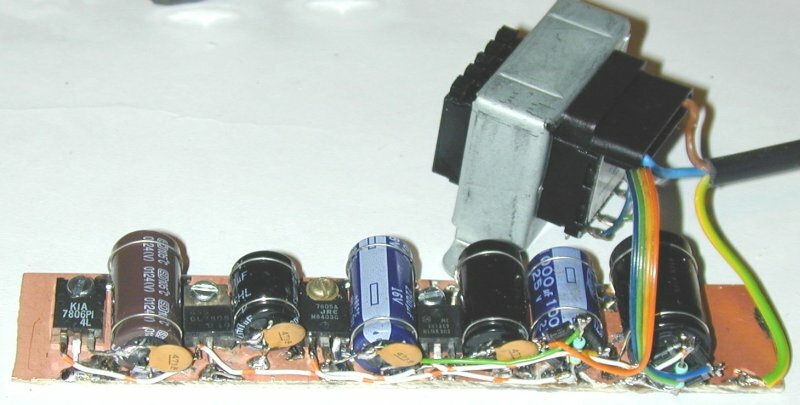 This PSU supplies regulated voltages of +12V, +6V, +5V and -5V. The design is fairly standard, using 78xx-series regulators. The transformer has two 15V secondaries rated 250mA each. I bolted the regulators to a piece of single-sided PCB stock which is in turn bolted to the back wall of the case. Holes drilled in the back wall provide a degree of ventilation. A slight variation of the circuit generates the -5V output using the more common 7805 +5V regulator instead of the 7905 -5V regulator. I destroyed my 7905 by falsely assuming that the pin connections of the 79xx series were the same as the 78xx positive voltage regulator series (see right). Failure was unspectacular, marked only by the non-recovery of the device when connected properly. Finding a spare 7805 in the junk box, the solution was simple (see my actual circuit below). Even more fortunate, the spare 7805 casing was very unusually of an all-plastic construction, rather than the normal kind which consist of a black plastic body fixed to a metal base which bolts to the heatsink. The plastic 7805 is 3rd from the left in the picture; note that the 7806 at the left is also all-plastic construction. I doubt the retard who designed the 7905 pinout was the same retard who designed the all-plastic regulator, but the result here was considerably greater ease of construction due to not having to insulate the case from the board.